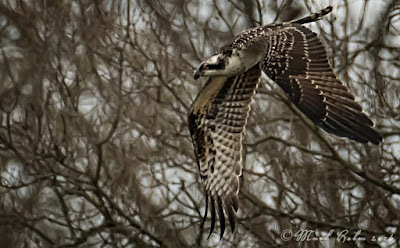 I was at my desk and I just caught a glimpse of a large bird flying up the river, Looking out the window I saw an osprey in a tree. I hurried to get the camera and get down to the river, it was on the opposite bank about 3/4 of a block away. I clicked off several pictures but the auto focus had a hard time picking it out of the background so I went to manual focus.